BELIZE CITY, Thurs. Sept. 15, 2016–We’re still trying to come to terms with the 11-0 blowout of Police United on Tuesday night at the FFB Stadium, at the hands of Mexican champions Pachuca, who had only managed to win 3-0 at altitude in their home game on August 23 in Pachuca, Mexico. The goals came at the 23rd, 27th, 30th, 35th, 44th, 51st, 69th, 73rd, 79th, 85th and 89th minutes. What went wrong? Is the level of our football in the Premier League of Belize (PLB) so far below that in the rest of CONCACAF, or is there some other explanation? Normally in professional sports, and certainly in the Mexican league, a record setting debacle like what transpired on Tuesday would be seeing some immediate changes in team personnel at the top level. The statistics (from concacaf.com) show that Pachuca was almost as dominant in Tuesday’s 11-0 shellacking as they were in the 3-0 game a couple weeks ago; but the major difference was in the final score. In Mexico, they took 29 shots to Police United’s 3, and they had 74 per cent possession to Police’s 26 per cent. 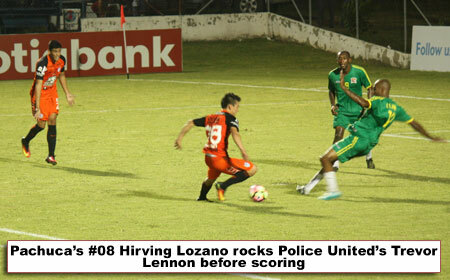 On Tuesday in Belize, they took 23 shots to Police United’s 5, while they maintained 67 per cent ball possession to Police’s 33 per cent. It would appear that Police gave Pachuca more space to operate in game 2, thus allowing them greater accuracy in their shots. Police threatened Pachuca’s goal more in game 2 than in game 1; but at the same time, they made themselves more vulnerable in defence. Police United’s coach, Charlie Slusher inspired hope in fans in his appearance on Plus TV’s Sports Zone on Monday night, proposing to play attacking football on the home turf. That may have been unwise, considering that in the present PLB tournament, Police United has not shown a great offensive game. If there is one consolation that we can hold on to from this game, it is that our Belizean players continued giving their all till the bitter end, and it was bitter indeed. Police United is not the best team right now in the PLB, but it is the one who will represent us again in a few weeks’ time, when we face Olimpia of Honduras in our last outing in Scotiabank/CONCACAF Champions League 2016-2017. It is a game that will see Olimpia going all-out to compete with the goal tally that Pachuca achieved. Police United has something to prove, that they are a better team than what fans saw on Tuesday last. In retrospect, this was probably the first time Belize fans have seen a foreign team so devastatingly dominant on our home soil. (Police United started the identical line-up as they did in the 3-0 loss in Mexico.) But, as we alluded to in our mid-week issue, the Police United brain trust should have seen it coming, as, unlike previous occasions, this time the visitors had all the incentive to bring their best team to Belize, not only to win, but to win big, because of their competition against Olimpia to qualify from our Group E to the coveted Hexagonal.